The album was recorded at LS Studios in Yorkshire and was produced by Byford with Andy Sneap mixing and engineering by Jacky Lehmann. It fairly bristles with muscular metallic intent, Paul Quinn and Doug Scarratt’s guitar work the best it’s ever been, while Biff’s vocals sound fresher and livelier. The songwriting too harks back to a classic era in Saxon’s history, with the likes of ‘Warriors Of The Road’, ‘Wheels Of Terror’ and ‘Stand Up And Fight’ evoking the halcyon days of yore with a contemporary twist, the classic Saxon sound absorbing the snarl, ferocity and attitude of contemporary bands (and fans) such as Megadeth, as evidenced by the crunching title cut ‘Sacrifice’. Besides the new material, Saxon will also be adding some unique recordings of revisited classics to certain formats of the release, also produced by Byford and mastered by Andy Sneap, including an orchestral version of Crusader and an acoustic version of Frozen Rainbow. 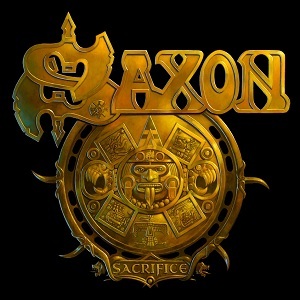 “From the songs to the production, I wanted to focus on the raw aspects which made us great In the first place,” concludes Biff, “And living in that rawness, combined with some great classic Saxon-songwriting, has in my opinion, made Saxon fresher than ever. Tickets for all venues are priced at £18.50 except for London* where they are £20.00 (all subject to booking fee). Tickets available at Kililive.com Tel: 0844 871 8803 and usual outlets. Doors for all venues open at 7pm. After more than 35 years and 13 million albums sold worldwide, Saxon are still relentless and passionate as they were back in the days of ‘Wheels of Steel’ and ‘Denim and Leather’. The influential heavy metal outfit has been an inspiration for the likes of Metallica and Megadeth and a front-runner for the New Wave of British Heavy Metal sweeping the nation in the late 70s-early 80s. New Studio album ‘Sacrifice’ out on February 25th, will be album number 20 in their stellar career, and fans are as excited as they were when Saxon first made their initial impact on the metal scene.